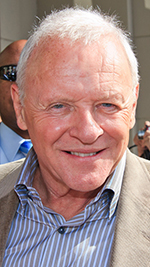 Anthony Hopkins at the 2010 Toronto International Film Festival, Toronto, Canada, September 21, 2010. Photo by GDCGraphics. Anthony Hopkins has become one of the most recognizable and beloved actors of his generation. Possessed of a marvelously destinctive Welsh-accented voice, success in filmdom did not come quickly for Hopkins, but it did happen eventually. Anthony Hopkins was born in Wales in 1937, and spent his childhood daydreaming and playing the piano. A chance encounter with Richard Burton resulted in Hopkins enrolling at the Royal Welsh College of Music & Drama, from which he was graduated in 1957. After two years of service in the British Army, Hopkins received further training at the Royal Academy of Dramatic Art in London, England. Hopkins trod the boards in the hinterlands until 1965, when Laurence Olivier invited him to join the Royal National Theatre, where he became Olivier's understudy. When Olivier suffered an attack of appendicitis during the run of The Dance of Death; Hopkins went on and "walked away with the part" according to Olivier. Faint praise indeed. Anthony Hopkins, however, yearned to be in films. His big break came when he played the role of one of Peter O'Toole's sons in The Lion in Winter (released in October, 1968). He continued to be active on stage, including appearing on Broadway in Equus in 1974. An ill-fated swing for the fences was the mystery / thriller film Magic (released in November, 1978). A vibe similar to Equus informed Hopkins' appearance in director David Lynch's adaptation of The Elephant Man (released in October, 1980). Hopkins then spent the next ten years playing a variety of characters which would benefit from the actor's obvious power and intelligence. Hitler in the TV movie The Bunker in 1981, Othello in a TV movie of Shakspeare's play Othello also in 1981, Quasimodo in a TV movie of The Hunchback of Notre Dame in 1982, Captain Bligh to Mel Gibson's Fletcher Christian in The Bounty (released in May, 1984), and Italy's foriegn minister to Nazi Germany in the TV movie Mussolini and I in 1985. As Hopkins has admitted that, when his agent sent him the script for The Silence of the Lambs, he thought it was a children's story. After reading it however, he knew that it was the role of a lifetime. Here was a part where Hopkins' skill and great instinct for how to play a character combined to create an indelibly sinister portrait which resonated with cinema audiences all over the world. Hopkins won the Oscar for Best Actor for The Silence of the Lambs (released in February, 1991), and the film made him a household name. Like several other leading men in Hollywood, Hopkins ping-ponged between Hollywood projects and smaller films. He followed The Silence of the Lambs with the Merchant / Ivory masterpiece Howards End (released in February, 1992), then went back to Hollywood with Francis Ford Coppola directing from his Silverfish in Bram Stoker's Dracula (released in November, 1992), playing Professor Van Helsing. Hollywood sometimes won. But Hopkins-watchers knew better. He gave what many consider to be his finest performance as an English butler in the film adaptation of The Remains of the Day (released in November, 1993). Hopkins has caused many another smallish film to have a chance at being made: a film of some of the life of C. S. Lewis in Shadowlands (released in December, 1993); he played John Harvey Kellogg in The Road to Wellville (released in October, 1994); played Richard M. Nixon in Olver Stone's Nixon (released in January, 1995), and provided an amazing turn as John Quincy Adams in Amistad (released in December, 1997). Returning to the Hannibal Lecter character for Ridley Scott's Hannibal (released in February, 2001, caused Anthony Hopkins to leave his imprints in the Forecourt of the Chinese. Since then, Hopkins has been exceedingly busy, providing filmgoers with an occassional towering performance: as a befuddled old Ptolmey in Alexander (released in November, 2004); as motorcyclist Burt Munroe in The World's Fastest Indian (released in March, 2005), and well, he has a recurring role in the Thor movies. More recently, Hopkins has cut quite a figure in the Cable Series Westworld in 2016, and Transformers: The Last Night (which played the Chinese in June, 2017). Mann's Chinese Theatre, Hollywood, California. Anthony Hopkins Forecourt block. Executed January 11, 2001. 49 x 43 inches. Mann's Chinese Theatre, Hollywood, California. 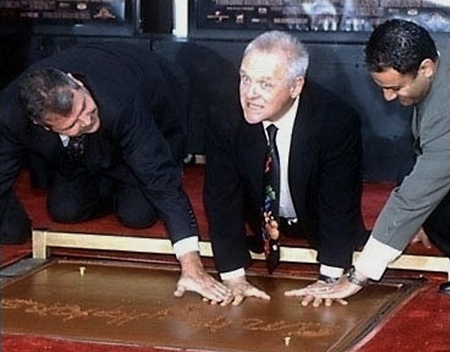 Anthony Hopkins Forecourt ceremony, January 11, 2001.